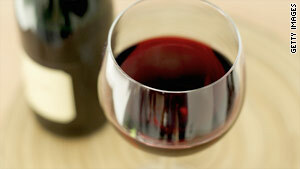 Wine was the most common drink among women in the study, but no one type of alcohol was linked to recurrence risk. (Health.com) -- Breast cancer survivors who have just a few alcoholic drinks per week are more likely than women who drink little or no alcohol to see their breast cancer return, according to research presented today at an annual meeting of breast cancer specialists. The increased risk was more pronounced among breast cancer survivors who had gone through menopause and those who were overweight or obese, the study found. Wine was by far the most common drink among women in the study, followed by liquor and beer, but no one type of alcohol was found to be significantly more or less associated with the risk of recurrence. In all, there were 349 breast cancer recurrences and 332 deaths during the follow-up period. Alcohol use was not linked to the risk of death from breast cancer, however. Cutting back on alcohol represents a real step that a breast cancer survivor can take to reduce her risk of recurrence. "More research should be done, but there is a growing body of evidence which suggests that women previously diagnosed with breast cancer should speak with their doctor about possibly limiting their consumption of alcohol," says the lead researcher on the study, Marilyn L. Kwan, Ph.D., a staff scientist at Kaiser Permanente in Oakland. Previous research has suggested that alcohol consumption may increase the risk of developing breast cancer in the first place. Kwan's research extends these findings to include the risk of recurrence among women who have already been diagnosed and treated for breast cancer, a population that numbers about 2.5 million in the United States, according to the American Cancer Society. "Cutting back on alcohol represents a real step that a breast cancer survivor can take to reduce her risk of recurrence," says Marisa Weiss, M.D., the president and founder of the advocacy group Breastcancer.org. "You don't have to give up alcohol, but use it more carefully and in moderation," she says. Limiting alcohol intake can improve the overall health of breast cancer survivors, according to Weiss, the author of the forthcoming book "Living Beyond Breast Cancer." "Alcohol is liquid calories, and being overweight is a risk factor for breast cancer," she says. "If you consume a lot of alcohol, you tend to be less physically active and/or smoke. So, for a number of reasons, that one step of cutting back on alcohol does have a number of health benefits." Exactly how alcohol consumption affects breast cancer risk is not fully understood, says Kwan, although estrogen, which fuels the growth of most types of breast cancer, is likely involved. "It has been suggested that alcohol could increase the risk of breast cancer by increasing estrogen metabolism and circulating levels of estrogen, thus promoting growth of the tumor," she says. "A similar mechanism might be responsible for increasing the risk of breast cancer recurrence." Drinking-related weight gain could also play a role, Kwan adds. "Obesity may...promote estrogen production and breast cell proliferation, in addition to the direct effect alcohol can have on estrogen metabolism and levels in the body," she explains. The study, which was funded by the National Cancer Institute, was presented at the San Antonio Breast Cancer Symposium, an annual meeting for oncologists, surgeons, and other breast cancer specialists. The symposium is co-hosted by the American Association for Cancer Research and the Cancer Therapy & Research Center at the University of Texas Health Science Center at San Antonio.